McDonagh Park, Nenagh was the venue for this All Ireland final between Tipperary & Meath under 14 ladies footballers. Meath had come through having defeated Tyrone in their semi final, 4:17 to 3:05. Tipperary had enjoyed a win over a tricky Roscommon side in their semi final, 2:10 to 1:06. Based on these semi final results a close encounter was forecast. The home âadvantageâ would count for little between these two teams on All Ireland final day. A nine point winning margin would appear to indicate a comfortable win in this yearâs under 14 âBâ championship. However those present would argue against this result being anything but comfortable. For three quarters of this enthralling encounter Meath were well in contention and taking the game to Tipperary. Meath began with serious intent and within four minutes were two points up on the Tipperary ladies who were playing with the advantage of a strong breeze. At times the Tipperary defence looked about to be overrun but gradually they clawed they way back into this game. In the seventh minute Clonmel Commercials Ava Fennessy had Tipp's first score to settle the side. In the eleventh minute full forward Boherlahanâs Ciara Dwan drew the sideâs level with her first point from play. The game now see sawed back and forth with both sides seeking an advantage. Tipperary were guilty of some bad wides in this period but when Tipperary and Fethardâs Niamh Hayes combined beautifully with Ava Fennessy and Leah Clancy for Tipperaryâs first goal in the fourteenth minute it appeared Tipp were in the ascendancy . This goal was immediately followed by a point from Ava Fennessy and Tipperary looked to be in the driving seat. Not to be outdone Meath now rallied and in the next three minutes scored two goals and a point to take the lead back. The Meath goals had come from Alannah Boland who was causing problems with her powerful runs. The Tipperary defence were now under considerable pressure from marauding Meath players and time and time again Fethardâs Alison Connolly was to the fore in breaking up these attacks. Alison at half back was outstanding in her reading of the play and at a period when Tipp needed to be strong she showed the way. Tipperary got to grips with the game once more and finished the half with five unanswered points from Ava Fennessy (2), Ciara Dwan, Carrie Davey and Caitlin Kennedy. Tipperary appeared to have weathered the Meath storm and held a two point lead at the interval, 1:08 to Meathâs 2:03 but now faced the prospect of playing into a very strong breeze and squally showers for the second half. Meath were first to attack in the second half but registered a wide after which Tipperaryâs Leah Clancy had a well taken point after the ball was worked through the hands upfield. 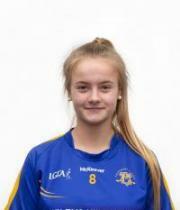 Ava Fennessy was now getting onto more ball for Tipperary and her strength at centre forward would prove vital. She followed up with a point for Tipperary but Meath came right back again and Tipp goalie Saoirse Teer made a fine block when a Meath goal looked certain. Tipp cleared their lines but once more Meath struck for two well taken points in the eight and tenth minutes to again close the gap. With only two points between the sides the next score would be vital and when Tipperaryâ Ava Fennessy took on the entire Meath backline and finished to the net it was exactly the tonic the Tipp ladies required. The game was now turning in Tippâs favour with the Tipp ladies playing lovely controlled football and maintaining possession against a very physical Meath team. The Meath physicality would prove their undoing as referee Cathy Forde had by now shown yellow cards to two Meath players for persistent fouling in the 23rd and 25th minutes. Ava Fennessy had her third goal from play in the 25th minute and try as they might from here on Meath could not penetrate the Tipp backline. They laid siege to the Tipp goals for the remaining three minutes but Tipperary were content to soak up the pressure and attack on the breaks. Meath finished with two points from a free and open play deep into injury time when goals were required. Full time score Tipperary 4:11 Meath 2:08. En route to this final Tipperary had defeated Limerick (twice), Waterford, Clare, Cork & Roscommon so these girls certainly have earned their All Ireland victory. The All Ireland Cup was presented by Marie Hickey, President LGFA to |Tipperaryâ joint Captains Ciara Dwan & Caitlin Kennedy. For her contribution to the teamâs success Ava Fennessy received the trophy for Player of the Match. Her contribution was immense, scoring a personal 3:04 on the day. Tipperary have now done âtwo in a row â in this grade, no small feat in such a competitive competition. Congrats to Manager Ed Burke (Moyle Rovers) and his management team of Frances Ryan, Garreth Byrne, Mary Murphy, Tony Smith and Physio Bill McCormack. Tipperary :Saoirse Teer, Ellen Moore, Maria Connolly, Cathy Hogan, Alison Connolly, Carrie Davey, Orla Winston, Caitlin Kennedy, Dervla Heffernan, Niamh Hayes, Ava Fennessy, Emma Fitzpatrick. Aisling Ryan, Ciara Dwan, Leah Clancy. Scorers : Ava Fennessy (3:04), Niamh Hayes (1:00), Ciara Dwan (:02), Aisling Ryan, Carrie Davey, Caitlin Kennedy & Leah Clancy (:01 each). Subs Used : Rosanna Kiely, Caoimhe Mulcahy, Rachel Moore, Eimear Boland. Panel: Emma Shelly, Rosanna Kiely, Caoimhe Mulcahy, Ciara Morrissey, Alice Ryan, Bronagh Bergin, Erin Bourke, Ellen Gantley, Queva OâMeara, Lauren OâBrien, Veerle Van Der Waal, Eimear Boland, Rachel Moore, Leah Maguire, Mary OâBrien, Megan Tynan. Tipperary U/14 ladies football have qualified for successive Under 14âBâ All Ireland finals following their defeat of Roscommon in St Brendanâs Park, Birr on Sunday 12th June. Tipperary had enjoyed a comfortable enough victory over Limerick in the Munster final and were favourites for this encounter. Despite enjoying the better possession in the opening stages Tipp were largely contained by a packed Roscommon defence and scores came from frees in the early stages. With fifteen minutes played Tipperary were only three points up on the Roscommon girls, two pointed frees from the Tipp number 13 Aisling Ryan and a nice point from play by Leah Clancy. The Tipp defence were on top where Cathy Hogan, Carrie Davey & Ellen Moore wwere doing well. In the sixteenth minute Tipp's flying Ava Fennessy was hit with a harsh sin binning for what was deemed an over robust challenge. Despite being down a player Tipp continued to press forward and were rewarded with a fine Caitlin Kennedy point from play and a pointed free from Aisling Ryan in injury time. Roscommonâs only score of the half was a pointed free by Kayleigh Shine. Ava Fennessy rejoined the play on the stroke of half time. Roscommon opened the scoring in the second half with a pointed free but Tippâs Caitlin Kennedy goaled some minutes later to put Tipp in the driving seat. The teams exchanged points in the fourteenth and sixteenth minutes with the Tipp score from Caoimhe Mulcahy who had looked lively since coming on at half time. In the twentieth minute Roscommon were thrown a lifeline with a goal from midfielder Michaela Keogh after the ball rebounded kindly to her off the Tipp crossbar. This goal gave the momentum to Roscommon who now seemed to grow in confidence putting increasing pressure on the Tipp defence for the next few minutes. Tipperary had being living dangerously for some time. Roscommon had another pointed free and when referee Kevin Phelan awarded Tipp a penalty in the twenty ninth minute the Tipp supporters breathed a sigh of relief. The Roscommon keeper made a fine save and again Roscommon attacked. When another Roscommon goal looked on up popped Tippâs center forward Ava Fennesy in her own defence to make a wonderful interception. Tippâs free taker Aisling Ryan and her Roscommon counterpart traded two pointed frees apiece. The final play saw Tippâs Ava Fennessy score a fine individual goal on the stroke of full time. Tipp had survived a spirited Roscommon fightback and will now meet Meath Ladies in this yearâs All Ireland Under 14 âBâ final in a few weeks time. Tipperary 3:14 Limerick 4:05. Tipperary U14s travelled to Charleville, Co Cork to play Limerick in the U14 B Final last Wednesday night. This was always going to be a tough assignment following so close on the previous weekends loss to Kerry in the 'A' final only four days earlier. In the early exchanges Tipperary where dominant but were not taking there scores easily. When the scores did come we had goals from Ava Fennessy and Rosanna Kiely. Limerick made an inroads on the score to get 1-2 without reply but Tipperary weere soon backin the lead with a goal from Ciara Dwan to leave Tipperary 3-5 to 1-3 up at half time. Tipperary kicked on early in the half tapping over point after point but soon Limerick came driving back into the game with 3 goals to leave only 6 points In the game with 5 minutes remaining. Tipp's Cathy Hogan was flying all day in the backs ensuring the Tipperary defence stood firm to win back to back 'B' titles on a final score of 3-14 to 4-05. Tipperary will next play Roscommon in the All Ireland Semi final on June 12th. Having defeated Cork in their last âAâ assignment during April hopes were high that this Tipperary team would compete with a strong Kerry under 14 selection in this the âAâ Munster final. Tipperary had also previously defeated Limerick, Waterford & Clare en route to this final so a fine crown settled into the Mallow GAA complex in anticipation of a close encounter on Saturday 28th May. Right from the start the Kerry ladies had a score from play from Danielle OâLeary and this trend continued for the early minutes with Kerry proving deadly accurate from distance while the Tipp ladies found it almost impossible to penetrate an excellent Kerry defence. Kerry appeared in no mood to allow any signs of weakness and with six minutes played were three points ahead. In the ninth minute Kerry Captain Siofra OâShea goaled from a penalty and try as they might Tipperary could not match the Kerry ladies power and footballing ability. Worse was to follow when less than three minutes later Kerryâs Rachel Dwyer scored a second goal from play to put Kerry ahead 2:03 to no score. Tipp had a pointed free from Aisling Ryan in the sixteenth minute and when Ava Fennessy scored a fine goal four minutes later it looked as if a mini revival was about to occur. Kerry however did not panic and they replied with a goal and four points in the next five minutes to again put daylight between the sides. Try as they might and try hard they did the Tipp girls were not allowed any time or space on the ball to make it matter. It was constant Kerry pressure and the Kerry Captain S OâShea in midfield was excellent setting up attacks and taking her own scores also. Tipperary began brightly in the second half with a nice Ciara Dwan point from play to which Kerry replied immediately. Tipperary now had two wides and Kerry again added a point. Whatever hopes Tipp had of staging a comeback were dashed when Kerry again goaled in the fifth minute, Tipp 1:02 Kerry 4:08. In fairness to the Tipp ladies they now began pressing forward more and great cheers greeted a Tipp goal from midfielder Caitlin Kennedy who soloed through for a fine individual score in the ninth minute. Right form the kick out Tippâs Ava Fennessy had another Tipp goal to make the scores respectable, Tipperary 3:03 Kerry 4:08. The two teams then traded points but from the twentieth minute on Kerry again got on top and now gave an exhibition of point scoring from distance, scoring that would do justice to many senior sides. Kerryâs OâShea, Dillane & Teahan added a further five points between them before Tippâs Caitlin Kennedy had the premier ladies final score from play in stoppage time. Goals may win games on many occasions but in this final it was the Kerry ladies ability to pick off points from outfield that proved the match winner. The Munster Cup was presented afterwards to the Kerry Captain Siofra OâShea who was also awarded player of the match. For the past fifteen years Kerry & Cork have been the only two names on this Munster âAâ Cup and this has not changed in 2016. Tipperary will have little time to dwell on this defeat as they are back in action next Wednesday, June the 1st in the Munster âBâ final where Limerick await. Should they be able to raise themselves in time for this encounter they are more than capable of going far in the All Ireland âBâ series.